Plants ready for habitat restoration at Yellingbo. Photo: Emma Campbell. 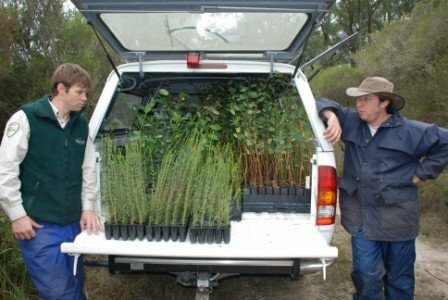 In partnership with Parks Victoria the FLBP have an annual revegetation or tree planting day at Yellingbo Nature Conservation Reserve. This day or weekend long activity is usually held in May each year to allow plantings to settle in over the cooler months. Habitat restoration at Yellingbo is critical as the vegetation quality senesces and key habitat features such as mature eucalypts and thick undergrowth with good connectivity decline. Watch this page for future planting opportunities!